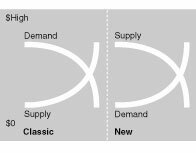 ...and technology simultaneously pushes up the demand curve while pushing down the supply curve. One very potent force shifts both sides. The quicker the price of transportation drops, the more quality and services and innovation are embedded into cars, planes, and trains, lifting the quality of the "wants" they satisfy. Over time, any product is on a one-way trip over the cliff of inverted pricing and down the curve toward the free. As the network economy catches up to all manufactured items--from cell phones to sofas--they will all slide down this slope of decreasing price more rapidly than ever. to send down the slide--in short, to invent items and services faster than they are commoditized. We will create artifacts and services rapidly, as if they were short-lived bubbles. Since we can't hold back a bubble's drift toward popping, we can only learn to make more bubbles, faster.